There's plenty to do and see in East Bali, as long as "party" is not at the top of the agenda. The attractions in Klungkung and Karangasem lean more toward cultural and nature-friendly pursuits. 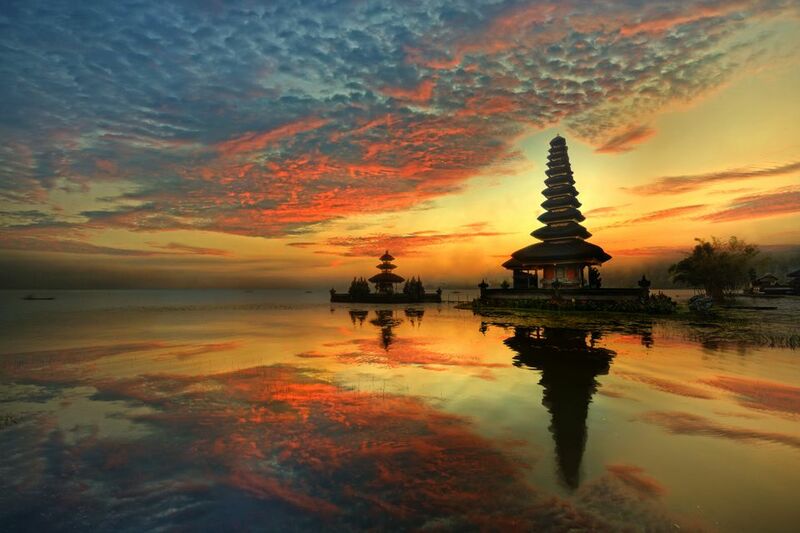 The region is home to a number of temples and royal structures along the coast, including the most important Balinese temple of all, Pura Besakih. Hiking trails criss-cross the mountainous terrain, and the waters surrounding East Bali are full of scenic diving sites. The next time you're in East Bali, check out one—or all—of these destinations. The 10,308-foot-high Gunung Agung is Bali's highest mountain—an active volcano whose beauty is nothing compared to its deadly power. In March of 1963, Gunung Agung erupted, covering the entire island in ash and destroying villages and temples with floods of lava and volcanic mud. Gunung Agung sleeps today, and the temples and towns in its shadow rest easy. Two hiking trails to the summit are popular with Bali visitors and are best climbed between July and September. Hikers are prohibited from climbing during religious ceremonies on Pura Besakih, and during these times no person should stand higher than the temple. Coined the "Mother Temple," Pura Besakih is the biggest temple in Bali—a sprawling complex of over 20 temples set on the side of the active Gunung Agung volcano. The temple complex venerates the Hindu trinity (trimurti) of Brahma, Vishnu, and Shiva, drawing thousands of pilgrims and tourists every year. With over 50 festivals conducted at Pura Besakih annually, you're likely to be in town just as one celebration is ongoing or about to start. Check with your Bali resort or hotel if you're going to be lucky when you visit. Pura Besakih is most easily reached via a bemo from Klungkung. The USAT Liberty was an American merchant ship that was torpedoed by Japanese forces during World War II. Taking on water fast, the ship was beached off Tulamben and stripped of her valuables. The eruption of Gunung Agung in 1963 ripped her in half and pushed her deeper into the water. Today, the crumbling remains of the ship can be explored by snorkelers and divers. The proliferation of coral and marine life in and around the ship make the Liberty one of the most popular dive destinations in Bali. This 19th-century royal palace combines Balinese, Chinese, and European influences within a complex of building clusters that used to house the King of Karangasem's formidable court, and it still retains a ceremonial significance today. The inner court features the king's former home (Loji) and retains some relics from those long-gone days. From photos of the king with Dutch colonialists to well-worn furniture, guests can get an inkling of royal life just before the Dutch came and conquered all. The descendants of the last king maintain a website that curates information and images about Karangasem's royal structures. The last king of Karangasem built this bathing palace in 1948, and it continues to fascinate visitors to this day. It's essentially a network of pools framed by an eclectic assortment of architecture. The present site is actually a reconstruction; the former structures were destroyed by the 1963 Gunung Agung eruption. The reconstruction captures much of the place's former charm. An 11-tiered fountain pagoda is the palace's most notable architectural feature, and swimming is allowed for a nominal fee. Goa Lawah is an ancient temple built in front of a bat cave. The bats, not the temple, are the main draw. The bats are venerated by visiting worshippers, who buy offerings from nearby vendors. According to legend, the cave extends over 19 miles underground to emerge at Pura Besakih. Balinese Hindus hold Goa Lawah in great regard where the afterlife is concerned. Worshippers stop at Goa Lawah to complete the Nyegara Gunung ceremony, a part of the Balinese funeral process: At Goa Lawah, offerings can be made to purify the newly released spirit so it can come home to the family’s household shrine. The Bali Aga, or the pre-Hindu original people of Bali, remain only in a few isolated communities on the island, the most famous one being the village of Tenganan about 10 minutes from Candidasa. The Bali Aga live in a walled community that enforces a strict separation between "pure" Bali Aga and the "fallen," who live outside the walls. The village is open to tourists in the daytime and offers a very different perspective on Balinese culture; the architecture, language, and ceremonies retain the old pre-Hindu ways. Tenganan's most famous product is a fabric known as gringsing, and its wearers are said to gain magical powers from its use. Despite its relatively obscure status, the temple of Pura Luhur Lempuyang is one of Bali’s most important religious places. As one of the island’s nine directional temples, Pura Luhur Lempuyang “protects” the native Balinese from evil spirits coming in from the east. The temple presents an interesting challenge to visitors: Reaching the top takes an hour and a half of serious climbing. The temple at the top offers awesome views of Gunung Agung, framed by the temple gate.